Biblical Numbers | Looking for that Blessed Hope! Israel held national elections just two years ago, but the current Knesset has collapsed and a new election date is scheduled for March 17. There are some very interesting facts and numbers surrounding the upcoming election, enough to give one pause…will it be their last election under normal circumstances? Numbers in the Bible carry very specific meanings and the study of biblical numbers is a study all in itself. One can read the excellent book “Number in Scripture:Its Supernatural Design and Spiritual Significance” published in 1921 by E. W. Bullinger for free at this link. The following facts and numbers are not scripture based except where noted, but yet are very intriguing at the least. Will some of these come to pass? Or is this just all coincidental? Only the Lord knows…. First, a little background on the Knesset. Likud (“ליכוד”) means “consolidation” or “unification”. It is the largest right-wing party in Israel and was founded by Menachem Begin, the 6th prime minister, in 1973. In 2005, Likud split when their leader, Ariel Sharon, the 11th prime minister, left and formed a new political party, Kadima (“קדימה”, which means “forward”). Eleven is the number for dissolution. Current PM Netanyahu is member and leader of the Likud party. HaAvoda (“העבודה”) means “the labor”. It was founded in 1919 while Israel was under British control. It was called “Ahdut HaAvoda” (“אחדות העבודה”), which means “the unity of labor”. It was originally led by David Ben-Gurion, who would later become the first prime minister of Israel. HaBait HaYehudi (“הבית היהודי”) means “the Jewish home”. It is a right-wing political party led by Naftali Bennet, the current Minister of Economy. Netanyahu joined the Israel Defense Forces during the Six-Day War in 1967, and became a team leader in the Sayeret Matkal Special Forces unit. He took part in many missions, including Operation Inferno (1968), Operation Gift (1968) and Operation Isotope (1972), during which he was shot in the shoulder. He fought on the front lines in the War of Attrition and the Yom Kippur War in 1973, taking part in special forces raids along the Suez Canal, and then leading a commando assault deep into Syrian territory. He was wounded in combat twice. Netanyahu – if he wins again, it will be his 4th time elected and 7th straight year of term into 2016. Seven is the number for spiritual perfection. Four “is emphatically the number of Creation; of man in his relation to the world as created; while six is the number of man in his opposition to and independence of God. It is the number of things that have a beginning, of things that are made, of material things, and matter itself. It is the number of material completeness. Hence it is the world number, and especially the “city” number”. This is the 33rd government of Israel. Thirty three is connected to a promise or the promises of God. The 33rd time Abraham’s name is used in the Bible is when Isaac, the child of promise, is born to him when he is ninety-nine years old (Genesis 21:1 – 2). The 33rd time Noah’s name is used in Scripture is when God makes a special covenant or promise with him. Thirty-three is also the numeric equivalent of the word AMEN. It is the 9th government to negotiate with the Palestinians since the signing of the Oslo Accord of 1993. Nine is the number of finality or fulfillment. Perhaps there will be no more negotiations. The March 17th election date is just 3 days before March 20th Total Solar Eclipse which falls within the latest blood moon tetrad, the last of this century. In any Menorah whether it is a 5, 7, or 9 branch Menorah, Jesus is always in the middle as the servant lamp. 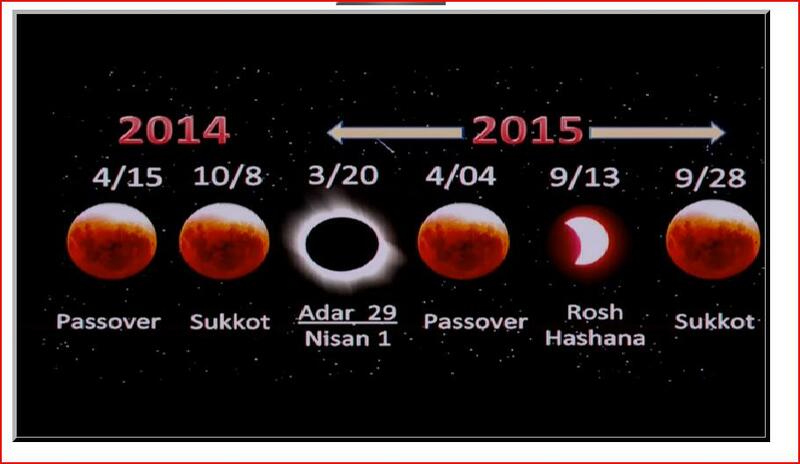 Here you have 2 blood moons, a total solar eclipse and then the last 2 blood moons. Could this be a warning that the light of the world is about to be taken out? Between March 20th and April 8th 2024, there are a total of 6 total solar eclipse. The number six symbolizes man and human weakness, the evils of Satan and the manifestation of sin.The time between the first one on March 20th to the last one in April of 2024 is 9 years. Again, Nine is the number of finality or fulfillment. For the total solar eclipse of August 21, 2017, the Jewish calendar equivalent is the 29th of Av, 5777. Three sevens…….and Seven is the number for spiritual perfection. Seven years later, for the last one on April 8th 2024, the Jewish equivalent is 29th of Adar 5784 – Spiritual perfection (7), new beginnings(8), for the world(4). The number 29 is the combination of 20, the number of expectation, and 9, the number of finality or fulfillment. During the year 5784, the nation of Israel will be 75 years of age. Abraham was 75 years old when God called him out of Haran. Could it be the story of Israel begins and ends at 75 years of age? 75 – seven is the number for spiritual perfection, five is the number for divine appointment. One last amazing parallel. The first Zionist Congress was convened by Theodor Herzl as a symbolic parliament for the small minority of Jewry in agreement with the implementation of Zionist goals. This took place in 1897. Fast forward 120 years and arrive at 2017 or 5777 on the Jewish calendar. 120 is made up of three forties (3×40=120). Applied to time therefore it signifies a divinely appointed period of probation. One hundred twenty years after God spoke those words…..His judgment was brought against the world with the Great Flood of Noah……..